Antioxidants play a key role in protecting the body against circulating free radicals, which cause damage to the cells and tissues. 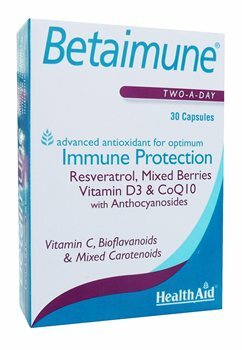 Betaimune contains a unique combination of well-known powerful Antioxidants, Mixed Berries, Pine Bark Extract, Mixed Carotenoids, CoQ10, Citrus Bioflavanoids, Red Wine Polyphenol Powder, together with carefully selected Vitamins and Minerals, for optimum immune support. Adults and children over 12 years of age, two capsules daily with food. Do not exceed recommended daily intake unless advised by a suitably qualified person. Food supplements should not be used as a substitute for a varied diet.